Caring for a child with complex medical needs is an enormous responsibility. It’s not uncommon for parents to be overwhelmed, exhausted, and sometimes downright frightened. But it doesn’t have to be that way. At BAYADA Pediatrics, we understand what it’s like to care for medically-fragile children at home. In fact, we’ve been doing it since 1980. But more importantly, we know how to care for them so well that we have set the national standard for pediatric home health care. It’s our goal to help and support you every step of the way, from the start of care and for as long as we’re with your family. Our skilled and experienced pediatric nurses are committed to keeping your family together by providing safe, exceptional care for your child in the comfort of your home. That’s our promise to you, your child, and your family. 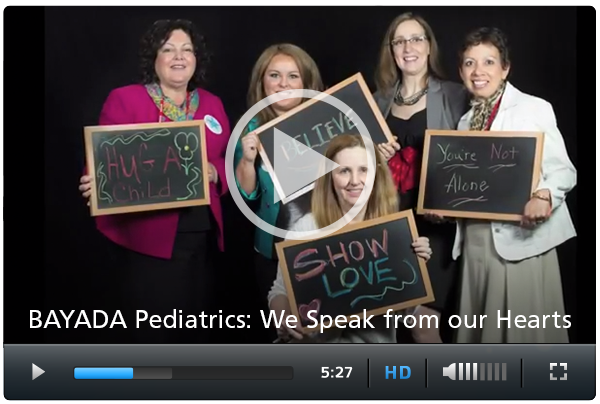 Ready to find out how BAYADA Pediatrics can help? Let’s get started. No two children are alike, so no one-size-fits-all plan of care is appropriate for your child. That’s why our clinical managers - who are also registered nurses - work closely with you, your child’s physicians, and other care team members to develop a plan that is customized to your child’s unique needs, situation, and goals. Prior to starting care, a BAYADA Pediatrics Clinical Manager meets with you to perform a complimentary assessment and answer any questions you may have. While we focus on developing a plan of care that supports the best outcome for your child, we also recognize how important it is to always consider your concerns, home setting, and preferences. The BAYADA care team — which may include nurses and home health aides — is selected to best-match your child’s needs. Our clinical manager is responsible for ensuring that all of your child’s caregivers are thoroughly acclimated to your home and prepared to deliver exceptional, safe care. Regular, ongoing supervisory visits by the clinical manager further ensure that your child’s needs are continually being met, and adjustments in care can be made as necessary. Your child is your treasure and finding home health care professionals you can trust is first and foremost. At BAYADA Pediatrics, we strive every day to provide care to our clients with the highest professional, ethical, and safety standards. You can feel confident in the abilities of our home health care professionals to provide the best, most compassionate care to your child. All of our nurses are thoroughly screened, trained, and demonstrate competency in clinical and emergency response by our clinical educators and managers. We are continually humbled by the trust our clients and families place in us every time our nurses enter their home. Taking a family-centered approach, our team focuses on what makes your family unique — siblings, pets, extended family, special activities, important routines. They all play an important role in customizing a plan of care that can best help your child to thrive at home – and to let your family be a family. We follow state and company Hiring Requirements for Employees. Clients and their care team have access to a 24-hour clinical support team member from their local office should any questions or concerns arise. Each BAYADA caregiver — nurses and home health aides — also has a clinical manager who provides ongoing mentoring and support. BAYADA is unmatched in our commitment to providing ongoing education and training to our pediatric care team members. Through one-on-one time spent with an experienced nurse, mentoring, hands-on lab demonstration, in-service programs, and scholarships for professional development, our caregivers continue to expand and improve the clinical skills they bring to their clients. When a child is transitioning from hospital to home, it’s an exciting, yet anxious time for many parents. To prepare, our transitional care manager will visit with you in the hospital to discuss everything that will be done to ensure your child has a smooth transition to home. We will work in partnership with the hospital team to ensure all equipment, medications, instructions, and care requirements are arranged. We invite you to ask as many questions as you have and to let us know your specific concerns and preferences. If it’s important to you, it’s important to us. Good news: our pediatric services are typically covered by a variety of public and private insurances. We are preferred providers for most private and group health insurance plans, and are licensed to provide Medicaid services – including Managed Medicaid and other government programs – in most states. Private pay is also accepted. We will contact your medical insurance company to determine your home care benefit, handle all of the requested paperwork, and bill the insurance company directly.